VMware’s Kiran S (Bangalore, India) and Fred Godoy (Georgia, U.S.) demonstrate Micro:bit with Havre Public Schools teachers. Technology has the power to unlock amazing new possibilities for our customers and the world. Through pro bono service learning, we translate the incredible potential of digital transformation from the corporate sector to our communities. Recently, I was fortunate to see this potential unfold—and watch a community transform. Havre sits in the rural plains of Montana. It was built around the Great Northern Railway, which runs through town bringing cargo from coast to coast. Havre is surrounded by both farms and Native American reservations. The nearest regional airport is a two-hour drive west, and the winters are quite harsh. About 40 percent of the Havre Public Schools students qualify for free and reduced lunch, and 35-40 percent of students are of American Indian descent. Without the resources or proximity afforded to many larger and urban school districts, Havre, with a population of roughly 10,000, has one of the most innovative school districts I have encountered. We initially began working with Havre Public Schools because they were already on the path to digital transformation. As a rural school district with limited resources, they had already reached nearly 1:1 device per student and already ran VMware software. After initial conversations and a more detailed discovery assessment, it became obvious there was significant potential for VMware to accelerate the school district’s digital transformation through a pro bono service learning engagement. Digitally transform the school district’s infrastructure. Accelerate the use of technology to supplement and enhance teacher and student experiences. As a multi-faceted collaboration, many organizations led to the success of our pro bono engagement with Havre Public Schools. With tight budgets, the school district’s IT staff operated outdated, out-of-warranty versions of VMware software. To bring the district further along its digital journey, the VMware Foundation donated current versions of VMware vSphere, VMware vRealize Operations and VMware vCenter. Dell Corporate Giving donated new servers that enabled the updated software to function. Further extending the ripple effects of our engagement, the CoSN team plans to use the lessons learned in Havre to create resources for similar rural school districts. As part of their pro bono engagement with Havre Public Schools, the VMware team employed the Solution Development Framework, a phased approach to discover, design, implement and maintain sustainable solutions that meet nonprofit needs. Detailed in research findings published by the VMware Foundation and Taproot Foundation, Transforming Technology Pro Bono, this practical guide to approaching tech pro bono engagements is intended to bridge the gap between tech employees’ and nonprofit staffs’ knowledge and understanding of the potential impacts of nonprofit digital transformation. Following this methodology, our diverse and cross-functional VMware team used a customer-centric lens to discover the unique needs of Havre Public Schools. By taking the time to learn about the environment in which we were working, getting to know the various stakeholders involved and listening to their unique challenges, we co-designed solutions that fit Havre Public Schools’ needs. Taking the time for proper discovery assessment and design phases led to a much smoother implementation that will have lasting impact and will be more feasibly maintained over time. 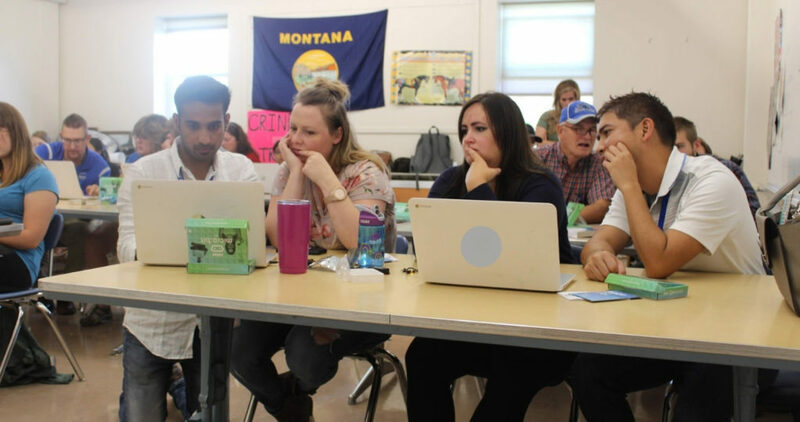 By applying their skills and talents in a different setting, the VMware team learned and developed alongside the teachers and administration in Havre. “I learned that you can deliver far more than you could ever imagine when you believe in yourself as much as you believe in the cause. That positive impact is multiplied when you add other like-minded colleagues with diverse skillsets and backgrounds, combined with an excellent support structure,” says California-based Carolyn Taylor, VMware Director, Global Compliance Services. “Ultimately, it is the relationships and personal interaction that makes learning meaningful and lasting. This amazing group of people consistently demonstrated this truth in every interaction they had with our staff, students and community,” says Carlson. Aligned with VMware’s focus on creating a better future for the company, the planet and the global community, the software solutions utilized in this pro bono effort will enable Havre Public Schools to operate more efficiently so school district staff and administration can focus on creating value for their students versus operating their technology. Our work with Havre Public Schools is a great example of the potential of pro bono service learning. While nonprofit digital transformation is uniquely aligned with VMware’s capabilities, every organization has the potential to utilize their talents to effect positive change by collaborating with nonprofits in their communities. Across industries, employing a customer-centric approach ensures that we achieve the best and most sustainable solutions.